What will the Democratic candidates say to voters whose livelihoods have been destroyed by austerity? Milwaukee—The Democratic presidential candidates will debate in Wisconsin on Thursday, five years to the day after Governor Scott Walker attacked Wisconsin public employees, public schools, and public services. The mass protests that began in Wisconsin and extended to Ohio, to Wall Street, and across the country in 2011 helped to frame a challenge to assaults on workers, income inequality, and the madness of austerity economics. The change in American politics began long before the 2016 campaign, with mass protests like those in Wisconsin and an Occupy Wall Street movement that put a whole new set of issues on the table. 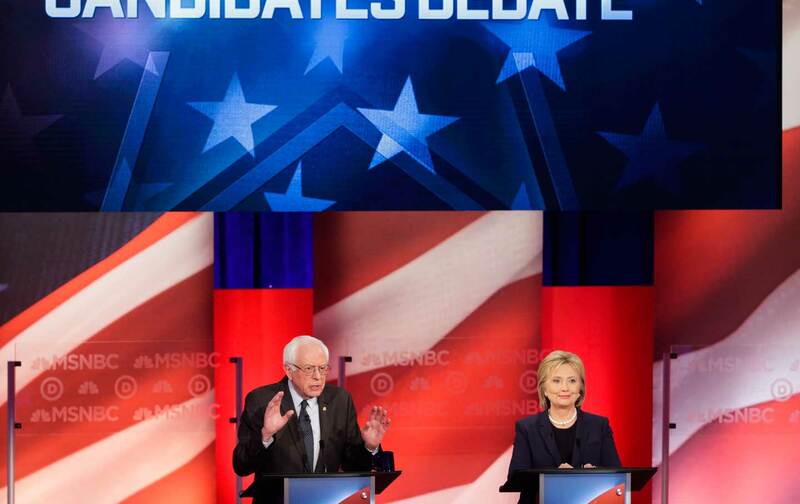 When Vermont Senator Bernie Sanders and former secretary of state Hillary Clinton debate in Milwaukee, much of the focus will be on the petty bickering between the campaigns. That’s to be expected, as this race has turned into a real contest, which is now expected to extend through February and March and on to Wisconsin’s April 5 presidential primary. That makes the Milwaukee debate a critical test, with meaning that extends beyond any state. The debate itself is being run by national media—in this case, PBS—and that’s understandable. Debates have become major news events for the candidates and for media outlets. In this volatile year, debates stir passions and ratings. But a debate in Wisconsin, especially on this day, could offer some distinct perspectives and insights regarding the moment in which the Democratic candidates—and Democratic and independent voters—find themselves. 1. What have been your most serious concerns about Wisconsin Governor Scott Walker’s impact on the state and about the austerity policies he has advanced nationally? Did you support efforts to hold Walker and his allies to account? What are you doing now to challenge and reverse the policies Walker advanced then and continues to advance? What have you done and what are you doing to challenge the austerity policies of other Republican governors such as Michigan’s Rick Snyder? Many Wisconsinites were disappointed by the cautious response of national Democrat Party leaders to the struggle that took place in the state in 2011 and 2012. There’s a yearning for national leaders who recognize that struggles in state capitols and at city halls often matter just as much as struggles in the nation’s Capitol. Too frequently, politicians in both parties run national campaigns and then lose touch with the nation. They get elected, focus in on the intrigues of Washington and only rarely show up for the fights on the ground over state-based austerity schemes like those of Walker and Snyder. The next president has to work hard in Washington. No one expects presidents to be on top of every issue in every community. But there is a growing sense that there are times when state and local struggles must be addressed. Walker debuted his “divide-and-conquer” politics in 2011. There was little doubt about what he was doing, and why. Nor was there much doubt that his assaults on public employees, education and services would result in economic stagnation—and that particular harm would be done to rural, low-income and minority communities. Walker’s failure is now evident—in job creation and wage-growth numbers that trail those in neighboring states and the nation. Walker has been rejected at home and nationally—his approval rating is down to 38 percent in Wisconsin and his presidential candidacy was rejected overwhelmingly by Republicans in the rest of the country. What Wisconsin voters will be interested in is evidence that these candidates are challenging Walker, Snyder and the austerity policies that have already caused so many problems (as Clinton did last Sunday, when she traveled to Flint) — and that these candidates will be willing to challenge the next Walkers and the next Snyders. 2. Wisconsin democracy has been mangled by out-of-state money. What concrete steps have you taken to address the crisis? What specific reforms have you proposed? In recent statewide and legislative campaigns, out-of-state money has flooded into Wisconsin. In many fundraising cycles, major contenders raise more money from outside Wisconsin than from in Wisconsin. That money has frequently come from billionaires and special-interest donors who want to warp the politics of the state in order to advance their ideological fantasies and business endeavors. Former Wisconsin senator Russ Feingold describes the contemporary campaign finance system as “legalized bribery.” Few Wisconsin Democrats and independents would disagree with that characterization. And it is easy to echo it. What’s needed is less echoing and more leading. The candidates need to get beyond baseline pledges to appoint better Supreme Court justices. Of course, Supreme Court appointments are important, and few Democrats have a problem with applying litmus tests in making those appointments. But the litmus tests lose their meaning after the justices are sworn in, as justices do not serve under instruction but are free to judge as they choose. The real fix for the campaign finance crisis must go deeper. It is necessary to amend the US Constitution to restore the essential premises that money is not speech, that corporations are not people, and that citizens and their elected representatives have a right to organize elections in which votes will always matter more than dollars. Dozens of Wisconsin communities have voted in referendum elections to urge our elected leaders to initiate a move to amend. Those activists are interested in specifics regarding what the candidates have done to advance such as amendment. And what have they done to implement equally necessary reforms, such as a ban on gerrymandering and the elimination of anti-democratic institutions such as the Electoral College? 3. What will you do to address the crisis created by failed trade policies? Few states in the nation have been hit so hard as Wisconsin by the neoliberal trade policies advanced by Wall Street elites and the Democratic and Republican politicians who make the interests of multinational corporations a higher priority than jobs, the economy and democracy. The North American Free Trade Agreement, permanent normalization of trade with China and related agreements have devastated industries that once provided tens of thousands of jobs. While trade policies cannot be blamed for everything that has gone awry for Wisconsin’s economy—Scott Walker’s policies have definitely done damage—no serious observer can or should neglect the shuttered factories and warehouses and the communities battered by bad trade policies. Major auto plants that existed through the 20th century in cities such as Janesville and Kenosha are gone. Sources of family-supporting employment, such as the cookware industry in northeast Wisconsin, have dwindled and in some cases disappeared. As the Wisconsin Farmers Union notes, the state’s agricultural heritage has been threatened by policies that are great for global agribusiness but lousy for working farmers, their families and rural communities. Just as importantly, the candidates must explain precisely what they would do to renegotiate existing trade agreements that were written to serve bankers and multinational corporations, not Beloit and Manitowoc.